The market requires the need to develop pump-turbines that reliably stand dynamic operation modes, fast changes of the discharge rate by adjusting the variable diffuser vanes as well as fast changes from the pump to turbine operation. In this publication, we study the various flow patterns linked to the operation of a pump-turbine system. The pump and turbine mode are discussed separately and different load cases at both operation modes are shown. In order to achieve competitive pump-turbine designs, we explain which design challenges should be considered during the geometry definition of a pump-turbine impeller. 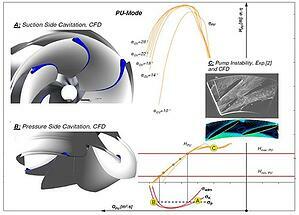 A runner-blade profile for a low head pump turbine has been developed. For the initial hydraulic runner-blade design, an inverse design method has been applied. Within this design procedure, blade geometry is generated by imposing the pressure loading-distribution and by an inverse 3D potential-flow solution. The hydraulic behaviour of both, pump-mode and turbine-mode is then evaluated by solving the full 3D Navier-Stokes equations in combination with a robust turbulence model. Based on this initial design the blade profile, the design is optimized and redesigned considering various hydraulic pump-turbine requirements. Finally, the progress in hydraulic design is demonstrated by model test results which show a significant improvement in hydraulic performance compared to an existing reference design. Read related blog: Come and see us present our paper at the IAHR 2018 Kyoto on on 'Optimisation of a pump-as-turbine runner using a 3D inverse design methodology'.